In 1995 I had a classic Wisdom School enlightenment experience of being entirely beyond the world, beyond consciousness and all experiences, yet myself, I was unknowable. I saw that even consciousness itself seemed like a joke, as were all objects within consciousness. For 15 years I dwelled in a kind of emptiness, the Void, where any sense of self was lost, and I would only “stare” into the void. There was little emotion during this period of time and just the mundane activities of everyday life. This was the kind of awakening that Nisargadatta and Robert Adams talked about, where one realizes one self, awareness, as noumena, outside of the realm of existence or experience, as outside of the manifest world. In 2009, I had an entirely different awakening experience, this time not to the absolute, the noumenal self, but to my existential self, the self that felt like I, me, mine but not as the body, but as spirit within and around my body. But this day something different happened. While feeling ecstatic bliss within I began to feel a great power arising from my umbilical area, slowly surging upwards towards my heart like a ball of light in a lava lamp. The feeling I had was of utterly immense power accompanied by a very bright white light, rising like plasma within my gut. This power continued upwards through my head and brain and out into space above. For me there was nothing else but this ecstatic, blissful, power and light, whose power and peacefulness made my heart bow to it’s presence in me as God. In full worship I dropped to my knees, then to the floor in full supplication and surrender to this power, this apparent “Other.” I was in the presence of God and was washed by his golden light of grace. I had become totally purified, empty, worshipful of this other. The Manifest Self was so easy to obtain compared to the dreary path of Advaita, or the no mind state of Zen where nothing is ever understood by the mind, and which took a lifetime to master. The problem with Advaita and Zen was the lack of respect paid to emotions and to the movements within everybody’s energy bodies, which were not even acknowledged in Advaita and Zen, and were considered as illusions by Zen monks. This website was originally designed in 2006 to present the teachings of my final guru, Robert Adams, as well as my other teacher, Jean Dunn’s understanding of Nisargadatta as presented in her three books and during my personal relationship with her. However, after my experience of the Manifest Self I had no choice but to change my teachings, because I saw the realization of the manifest self was far easier to obtain, and could be obtained by a much larger audience than discovering oneself as the absolute, the Witness. Therefore, I am in the process of reorganizing this site and opening it up to more of a Tantric approach of using emotions, love, developing ongoing experience of internal energies energies through various methods, and listening to sacred music to develop devotion and surrender as a way of life, not only to the God within but towards others, because I found by finding the energy core in and other, and loving it in another, I was able to discover it in myself, and when I discovered it in myself, it revealed itself to me in its full stature and glory as the Manifest Self, as the Life Force, as God. Feel welcome to come to online Satsang on Sundays at 11 AM Arizona time at http://zoom.com. July, 2014... More of Edji's latest Online Satsang Videos now available! January, 2014... EDJI BOOK NOW AVAILABLE FOR FREE! 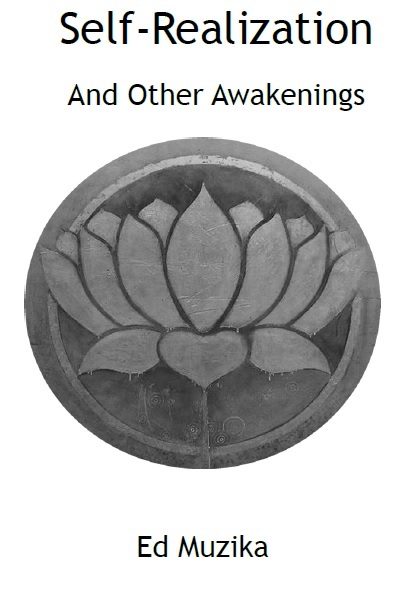 This book is about the practical aspects of attaining Self-Realization, an awakening as to all that YOU are by getting rid of all of the concepts, habits, conventions and conditioning that blind you to the greater YOU. To become the Self that you are you have to become naked and unknowing. Can you walk with me into Nothingness to discover the miracle you really are? LIVE AND FREE ONLINE SATSANGS! This book is about the practical aspects of attaining Self-Realization, an awakening as to all that YOU are by getting rid of all of the concepts, habits, conventions and conditioning that blind you to the greater YOU. To become the Self that you are you have to become naked and unknowing. Can you walk with me into Nothingness to discover the miracle you really are? articles from July 8, 2012 through April 25, 2013. From Edji: This website contains the equivalent of hundreds of printed pages representing decades of my writings. All of this 'older' information has been preserved and presented in this website as many may find this information of value. For my present day, and more advanced teaching, please see the information under ADVANCED TEACHINGS, SATSANGS and visit my BLOG. From the Webmaster: This is a fully interactive website so you may listen to our audio files, watch our videos or read the posted documents and books without having to leave the website. There are numerous pages under many of the main menu items (some of which have been duplicated for ease of reference) so we invite you to come back as often as you like and to download all that you find of interest. All donations to support Ed's charitable projects are greatly appreciated.